Saturday when I should have been studying for my Micro Final that was today I was, in fact, browsing all my favorite recipe sites instead. 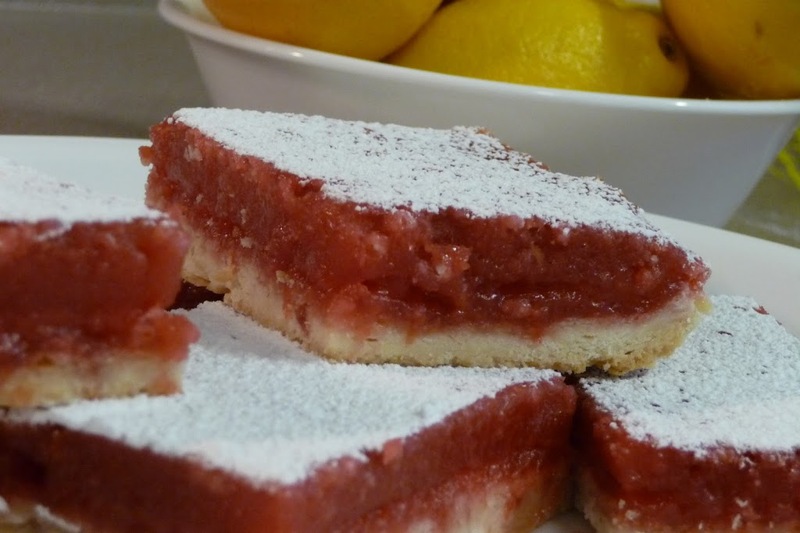 I stumbled across a recipe for Raspberry Lemonade Bars and sent Jordan to the store for the ingredients, but by the time he got back I had convinced myself to wait until today to make them. It was a tough call since lemon bars are one of my favorite desserts! I like to think that my stress baking before and then my relaxation baking after tests makes up for all the other crap Jordan has to put up with but I’m not sure that it does…. these were quite good though! Since it is dark and rainy outside (and I don’t have any special lights) my picture is woefully lacking….bear with me as I try to learn. 1. Preheat oven to 350 degrees. Line a 9x 13 pan with parchment paper. 2. Cut butter into powdered sugar and flour until crumbly. Press into the bottom of the pan. 3. Bake for 20-25 minutes or until golden brown. While it is cooking, prepare the filling. 4. Whisk sugar, eggs, lemon juice, zest, flour, salt, and raspberry juice in a large bowl. Pour over hot crust and bake for 25-30 minutes until filling is completely set. Let cool completely and dust with powdered sugar.